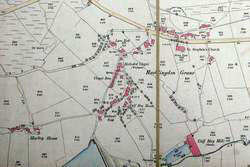 Haslingden Grane reached its most prosperous point around the middle of the nineteenth century. At that time another form of employment for many of the local people was quarry work. For centuries there had been many small quarries in the valley, but quarrying developed on a much larger scale from early in the nineteenth century. The Roscow family opened a large quarry at Clough Head, now the site of a car park and a visitor centre. Soon afterwards they began to open quarries along Musbury Heights, the hills that form the southern side of the valley, and a tramway was constructed to carry away the stone flagstones. By the 1840s the textile industry had become more industrialised. Weaving at home came to an end, unable to compete with the large mills that used steam power and more efficient machinery. In Haslingden Grane cotton mills opened at Calf Hey and at Holden Wood. Another option would have been to seek employment at the larger mills in Haslingden and Helmshore, both of which were within walking distance. 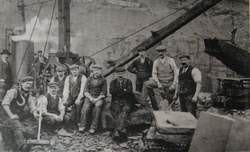 Many of the quarrymen and mill workers lived in Haslingden Grane village. The turnpike road through the valley towards Blackburn was opened in 1810, and the village developed along that road at Crow Trees and south of the road a little further west. As mentioned earlier, a Wesleyan Methodist chapel opened in 1815, with a terrace of houses next to it known as Chapel Row. The site of Chapel Row has become a car park that provides an alternative to Clough Head as a place to start your exploration of Haslingden Grane. 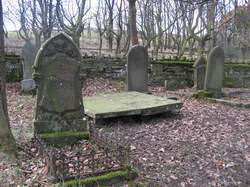 The Methodist chapel has been demolished, but part of its cemetery with several gravestones has been left in place. 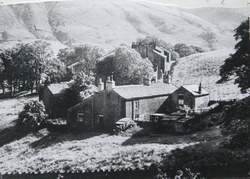 A short distance north of the car park Ellis Ratcliffe, the textile entrepreneur mentioned earlier, rebuilt the farmhouse of Holt Clough early in the nineteenth century. He also built three cottages, each with a loom shop. After home weaving came to an end these cottages found other uses as a joinery, a grocer's shop, a butcher's shop, a smithy, and an unlicensed beer shop. In 1836 a National School opened on the north side of the main road. It provided a basic education to children from Church of England families, and in addition religious services were held there. 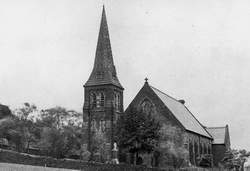 The development of Haslingden Grane village was completed in 1863 when St Stephen's church opened. It was built on the opposite side of the main road to the National School. Another occupation for which the valley became well known was the production and sale of whisky. This form of enterprise would not feature in official records, but we know about it from reports of two court cases. In one case a group consisting of Excise officers, policemen, and the Divisional Supervisor of the Inland Revenue visited Bentley House at 11.00 pm on the evening of 3 April, 1857. As they searched the house, occupied by Jonathan Haworth, they noticed that several flagstones on the floor had been freshly laid. After taking up some of the flagstones and some earth beneath them they discovered an arched entrance cut out of solid rock. They passed through the entrance in a creeping position and found themselves in a chamber containing a new still and all the apparatus needed for the production of whisky. There was a fireplace with a flue leading under the floor of the house into the main chimney in such a way that only one plume of smoke would be seen rising from the building. In court Jonathan Haworth received a prison sentence with hard labour. Then on 25 August 1858 the Supervisor of Excise and two Inland Revenue officers went to the home of James Morris at Far Pike Low. On entering the house they found Morris reading the bible, and when they stated the object of their visit Morris lifted his eyes to the ceiling in astonishment and protested before man and God that he was as innocent as a child unborn. The officers were not, however, gammoned, but began digging in search of evidence. After three days they found some lead pipes that led to a subterranean cavern being used as a distillery. The pipes carried water from a well for over a hundred yards into the distillery, and there was an underground passage in which a tramway could transport articles from the factory to the still. The whisky was said to be of a superior quality. James Morris was sentenced to the maximum fine of £200. According to the Supervisor of Excise there was no doubt that the distillery had been constructed at the same time as the farm, some fifty years earlier, and had been used by James Morris' father before him. The Inland Revenue would have been defrauded out of about £700 a year. You can read the full details of the discovery of James Morris' distillery in the Blackburn Standard of 1 September 1858. The village, Calf Hey cotton mill, and Hartley House on an Ordnance Survey map of 1893. Pupils and staff at Haslingden Grane school in the 1890s. The headmaster is J T Pilling. Please let me know if you can identify the female teacher or any of the children. Part of Haslingden Grane village, looking south. The Methodist chapel is obscured by trees in the centre of the picture, but beyond it you can see Chapel Row. 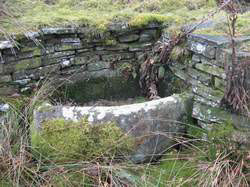 A dying trough near Chapel Row. Note the curve on the front face that would have allowed any overflow to run down rather than splash the user of the trough.